The cousin of famous poet/philosopher Ralph Waldo Emerson, and a close friend of Abraham Lincoln, Rockford’s Ralph Emerson built his own fortune and then helped others to build theirs, lending skill and funds to dozens of local enterprises that may not otherwise have survived upheavals of the mid-1800s. He was closely connected to more than 40 local businesses and charities, some nationally known, and founded an institute in Alabama for the purpose of educating newly freed slaves. 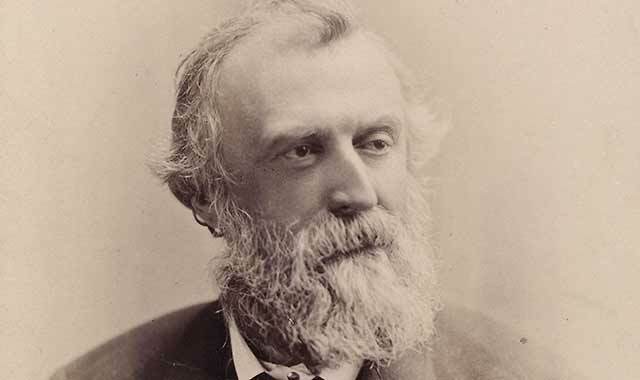 Ralph Emerson (1831-1914) was a towering figure, both physically, at 6 foot 4 inches, and in his influence on Rockford industries and culture. In a brief autobiography, he tells of growing up so fast in Andover, Mass., that his extreme height caused him to be lonely and shy. He speaks of having no friends and doing poorly in school – until he discovered a talent for mathematics. As a teacher, at age 19, he found his height was an advantage when managing large, unruly boys. En route to Bloomington, Ill., to study law with Kersey Fell, Emerson passed through Rockford and was highly impressed by the Water Power District at the confluence of Kent Creek and the Rock River, where many growing industries were clustered. In Bloomington, he boarded with the Fell family, taught their children and clerked in Fell’s law office. It was there that he met Abraham Lincoln, then a circuit rider from Springfield who assisted local lawyers when court was convened. The two became intimate friends, and it was on Lincoln’s advice that Emerson abandoned law and became a businessman. At age 21, Emerson used a loan from his father to go into the hardware business, in Rockford, with partner Jesse Blinn. Again Emerson’s height worked to his advantage. He overheard people guessing that the new hardware merchant was 28, so he never mentioned his real age. Among the hardware store’s customers was John Henry Manny, of Waddam’s Grove, a small town near Freeport, Ill. Manny and his father, Pells Manny, and a cousin, John Pells Manny, were building reapers there. In 1852, they built 84 reapers at $135 each. The greatest difficulty in producing efficient reapers was that the cutter blades became dull too quickly. John Pells Manny, once a blacksmith, came up with an oil tempering system that improved the sharpness and durability of the reaper blades. In 1853, the Mannys offered to bring their business to Rockford if Blinn and Emerson would trust them for the materials to build the reapers. Manny was a brilliant inventor, but the company needed someone with business sense, and Emerson was that person. He could see that the company did not have enough capital to make the reaper business grow. To bring cash into the enterprise, Emerson negotiated a partnership with Wait Talcott, a prosperous farmer in Rockton, Ill., and the reaper business flourished. In 1853, the company built 150 machines and John H. Manny displayed one of them at the New York World’s Fair, where he won a gold medal. In March 1854, Emerson and Jesse Blinn joined John H. Manny, Wait and his brother Sylvester Talcott in a new firm, Manny and Company. Emerson wrote, “In the summer of 1854 there was a great reaper trial on Squaw Prairie just north of Belvidere for a prize of $1,500 … to my surprise I, who had never before seen a handful of grain cut by machine, was called to aid in deciding this important contest.” The result of the contest was a draw, but the Manny reaper gained plenty of publicity. That year, they built and sold 1,100 reapers. Manny employees and their families then made up one-tenth of Rockford’s population of 6,700. While engaged in the reaper business, Emerson also continued in the hardware store. Although he confessed in his autobiography that he knew little about mechanics, he was in charge of the reaper factory when Manny and Talcott were away, and was forced to make decisions he hoped were right. Much of the painting and packing of the reapers was done outdoors and the machines were spread all over the south end of the Water Power District. As the weather grew colder, the workmen complained about working outdoors. The next day, Emerson showed up at 7 a.m. in a red flannel shirt, carrying a hammer, wrench and screwdriver, and for two bitter and stormy weeks worked 10-hour days in the open air with the best of them. He heard no more complaints about working in the cold. The reaper was arguably the most important invention of the 19th century because of its impact on food production. When harvesting grain with a hand-held scythe, a man could reap only two or three acres a day, and had only seven to 10 days in which to do it before the grain was fit only for animal forage. He could manage to feed his own family, but would have very little left over to sell. Even an early reaper could cut 15 acres a day. It was the unstoppable idea whose time had come. Cyrus McCormick of Chicago laid claim to the invention of the reaper, though he was more promoter than inventor. Using a design that his father had originated, after 28 years of work, and adding improvements by Jo Anderson, a slave owned by the McCormick family in Virginia, he eventually had a reaper to sell. Then he built his company by training sales agents around the country to demonstrate the reaper in the field. He was relentless in his attempts to put his competitors out of business, and, often succeeding, built his company into the agricultural industrial giant we know as International Harvester, now owned by Navistar. He was aware of Manny’s reaper; one of his agents had bought the first reaper finished at Manny & Co., although no one in Rockford knew, at the time, that the buyer was McCormick’s spy. The two reapers competed in many contests and Manny often won. In 1855, his company built 2,900 reapers. At the International Exposition in Paris, in 1855, both Manny and McCormick exhibited their reapers. Manny won a silver medal and received orders for two machines from Napoleon III. When McCormick claimed to have won a gold medal, Manny offered him $1,000 to display it. McCormick refused. McCormick then brought a lawsuit against Manny for patent infringement, asking for $400,000 and for Manny to cease manufacture until the trial was over. The court, however, recognized the lawsuit as McCormick’s blatant bid to get rid of his strongest competitor and refused to stop Manny’s production. One of Manny’s lawyers was Emerson’s old friend, Abraham Lincoln. While attending the trial in Cincinnati, Emerson did his best to console Lincoln when it became obvious that the attorneys from the east, Edwin Stanton and Peter Watson, were ignoring any of Lincoln’s attempts to participate in the trial. He had been hired only because, initially, the trial was to be held in Chicago, and they needed a local lawyer on their team. Now they considered him only an observer. Lincoln felt humiliated and angry. While walking together after the first day of the trial, Lincoln told Emerson that he planned to study the law with more determination than ever, to catch up with the college-educated Easterners. Manny won the lawsuit but died soon afterward, at age 30. In a bit of poetic justice, a few years later, President Lincoln presided over a cabinet that included Stanton as Secretary of War and Watson as Assistant Secretary of War. Meanwhile, back in Rockford, in 1857, there was a financial crash that, combined with expenses of the trial, put the reaper company in jeopardy. Emerson fended off creditors daily and managed to keep the company alive as Talcott, Emerson & Company. By 1860 it became Emerson & Co.
A bright spot turned up when, in the fall of 1857, Emerson stopped in at Wait Talcott’s home in Rockton. Wait’s daughter Adaline opened the door and the two of them fell in love at first sight. She was so petite that Emerson ever after called her “The Little Lady.” In September 1858, they were married and moved into a large home at 427 N. Church St. They expanded the house into a 30-room mansion that was a Rockford landmark until it was razed in 1933. Of their three sons, two died in infancy and the surviving son, Ralph, was killed as a young man, heroically fighting a fire at the Water Power District. They had five daughters: Adaline, Harriet, Mary, Belle and Dora, all of whom attended Wellesley College, in Massachusetts, and emulated their mother in community activities. The family donated the land south of their home, where the Mendelssohn Club now stands. The Emerson House at 420 N. Main St. was built for Belle Emerson and her husband, Dr. Darwin Keith, and was the site of the first classes of Keith School, now a familiar and highly respected preschool through 12th grade private school. Ralph Emerson went on to be prominently connected either as president, vice-president, director, trustee, sole owner or leading partner of more than 40 manufacturing, commercial, financial, agricultural and charitable enterprises, some nationally known. Besides the manufacture of agricultural implements, the businesses were involved in knitting machines, notably Burson Knitting Company, the first to be able to turn the heel of a sock by machine instead of installing it by hand; and Nelson Knitting Company, whose red heel socks later were turned into Rockford’s iconic monkey sock dolls. Emerson’s interests included the Winnebago National Bank and other financial enterprises. He dealt in cotton goods, woolen goods, lumber, insurance and the production of electricity for city lighting. He also, at one time, had three square miles of farmland under cultivation. Shortly after the Civil War, he founded the Emerson Institute at Mobile, Ala., for the purpose of educating newly freed former slaves. He belonged to the Second Congregational Church but never joined any lodge and never ran for public office. When would he have had time? In 1895, the reaper company became Emerson Mfg. Co. and, in 1909, a new partner entered the picture, Charles S. Brantingham, from the Nelson Knitting Company. Brantingham’s reputation was that of a ruthless competitor but a fair employer and a model citizen. He had visions of supplying agricultural equipment around the world. To expand without having to “reinvent the wheel,” he acquired successful companies such as Geiser Manufacturing Company in Pennsylvania, producers of steam engines; Pontiac Buggy Company and the Newton Wagon Works, for carrying and hauling; and the Rockford Gas Engine Company. His last acquisition, the Big Four Tractor Company of Minneapolis, was one company too many. It built huge, plains-busting tractors and plows that were no longer in great demand. Steam engines, likewise, were being replaced by internal combustion engines, and we all know what became of buggies! Emerson-Brantingham was in serious financial trouble. In November 1928, J. I. Case of Racine, Wis., bought Emerson-Brantingham’s assets, which included 28 vital patents and an enormous plant, the largest in Rockford. Eventually, J. I. Case ceased operations in Rockford and sold the plant to the city for $1. It’s now in use as the City Yards. However, examples of Emerson-Brantingham products can be seen in the Paulson Agricultural Museum in Argyle, Ill. The late Warren Paulson was an enthusiastic collector of the agricultural machinery now displayed in the museum. He even found pieces of an original Manny reaper, under a corn crib, and rebuilt it for his museum. Tinker ended the memoir with this tribute: “Thinking of men in the directory of the company, with whom I have been associated for nearly half a century – and who is left? None, save Mr. Emerson, who from the time of its early reorganization has been the secretary of the company and its leading spirit, one upon whom we have ever leaned, a man who for length of vision and breadth of mentality is without a peer in the city of his adoption. May he be spared to us at least till I am called hence – is the selfish prayer of R. H. Tinker.” His prayer went unanswered, for Emerson died 10 years before Tinker. When Ralph and Adaline celebrated their 55th wedding anniversary in 1913, the Little Lady, eight children later, was still little enough to wear her brown taffeta wedding gown with the lace collar. She prepared a collection of love notes she had previously written to Ralph. One of them said, “You have been and ever will be a wonderful man. God bless you and keep you in perfect peace.” Ralph died in 1914 and the Little Lady in 1915, but their influence is still felt in Rockford. This entry was posted on Thursday, August 27th, 2015 at 11:57 am	and is filed under Features, Top Posts. You can follow any responses to this entry through the RSS 2.0 feed. Both comments and pings are currently closed.